Captain Cole Kirby is pictured side by side with teammates warming up for practice. Keeping your muscles warm and ready for practice is a necessity when trying to prevent injuries. 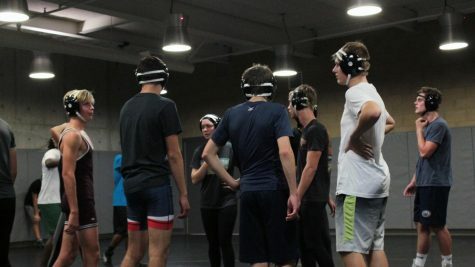 The wrestling team has been assembled with 14 wrestlers, among them are five new freshmen. This year marks the beginning of the team’s sixth season, and while they might not be as well known as soccer or basketball, this team is one to watch this year and their passion might just push this group all the way. But then the question occurs, why? Why put yourself through the hours of conditioning? Why put yourself through the weekend tournaments? Why ask to be thrown on a mat? Why force your body through such intensive tasks? The answer is simple. For most wrestlers, it isn’t about the workouts or what you are learning on the mat, but rather the lessons you get to take away. “One of the most important things about wrestling is what it teaches you. It teaches you all the things you need to know in life. It teaches you what you need to know to be able to persevere when it gets difficult. It teaches you when to have discipline when you need to. It teaches you when to be graceful in success and how to put your nose to the grindstone when you lose. Wrestling is about life,” Coach Brian Kirby said. Coach Kirby is returning for his fifth year to educate and oversee his team to become the best wrestlers they can be. Prior to being a wrestling coach, he participated in men’s wrestling for eight years. The team gathers together to pick their next game for practice. While the team is focused on training, the coaches like to mix it up and not lose the fun, so time is spent playing games that help build speed and endurance. For a little bit of background, wrestling goes through C.I.F., then Masters (if qualified), and finally State. “My wrestlers will leave this program ready to compete. They’re going to understand what competition is because in your life there is always competition,” Coach Kirby states when asked about other goals for the year. Captain Junior Cole Kirby, grandson of Coach Kirby is prepared to compete and show leadership towards his peers this year. Following in his Grandfather’s footsteps, Cole started wrestling in 6th grade and has been an active member of the team since his freshman year. This year he feels as if he, “can really bring the team together and bring out the best in each of them,” and looks forward to it. Freshman Nikita Ovchinnikov is a first-year wrestler and expresses his personal as well as team goals for the 2018-19 season. “As far as we can go. We won’t give up. This requires us to win every tournament and match so we can show [that] our small team can compete,” Ovchinnikov said. Ovchinnikov believes that the team has what it takes to maybe win a CIF championship even with a small team compared to others. The team has been training hard, and when it comes to matches and tournaments, Sage is ready to give it their all. The dedication shows: practices occur Monday through Friday from 4 to 6 P.M., duels are on Thursdays and tournaments on the weekends and can last for up to 12 hours. The wrestling team is ready to add another trophy for Sage and follow a great legacy. Coach Kirby ended his interview with a brief statement on the team’s comradery. 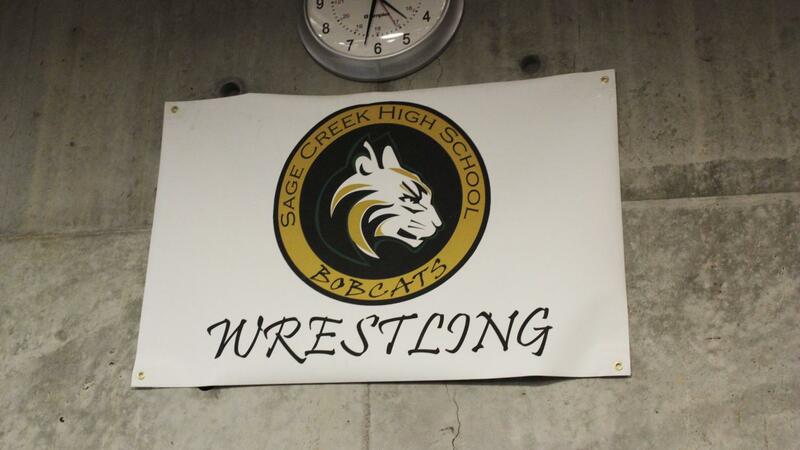 The wrestling sign hangs below the clock. This reminds wrestlers to not forget the team aspect of the program. Freshman Peter Rubin stretches while waiting for coaches to give instruction. 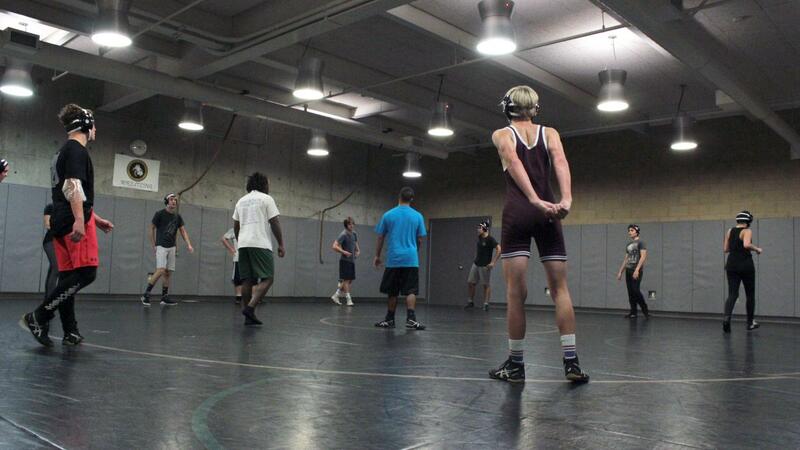 Muscle injuries are common in wrestling so the team makes it a necessity to be fully prepared for practices. 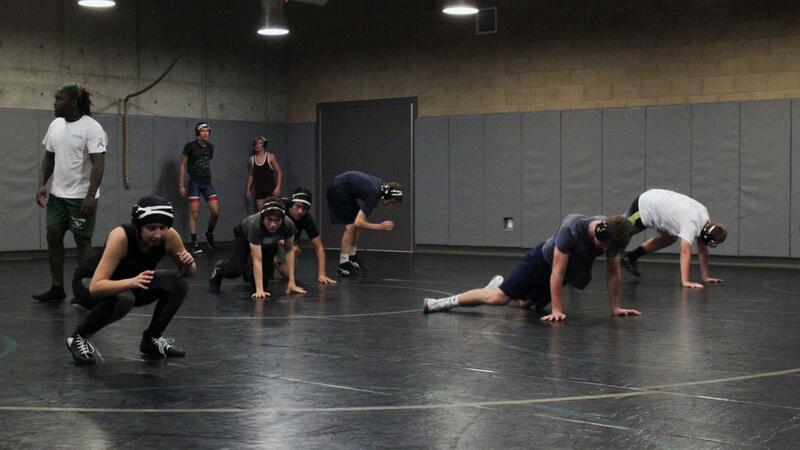 The wrestling team during practice performing a drill known as “sprawling.” The teams practices Monday through Fridays.